The Wexler home plan's authentic Craftsman bungalow exterior includes charming details that radiate curb appeal. The double columns, cedar shake and stone detailing create a welcoming facade. The two-story foyer opens into the dining room with a decorative coffered ceiling. A banquette in the kitchen maximizes usable space on the main floor. Built-in shelves behind the banquette seating save space and are easily accessible from the kitchen and e-space. The great room's vaulted ceiling gives way to a large screen porch with a 12 foot ceiling. The master bedroom includes an elegant cathedral ceiling, a large walk-in closet and convenient access to the central utility room. 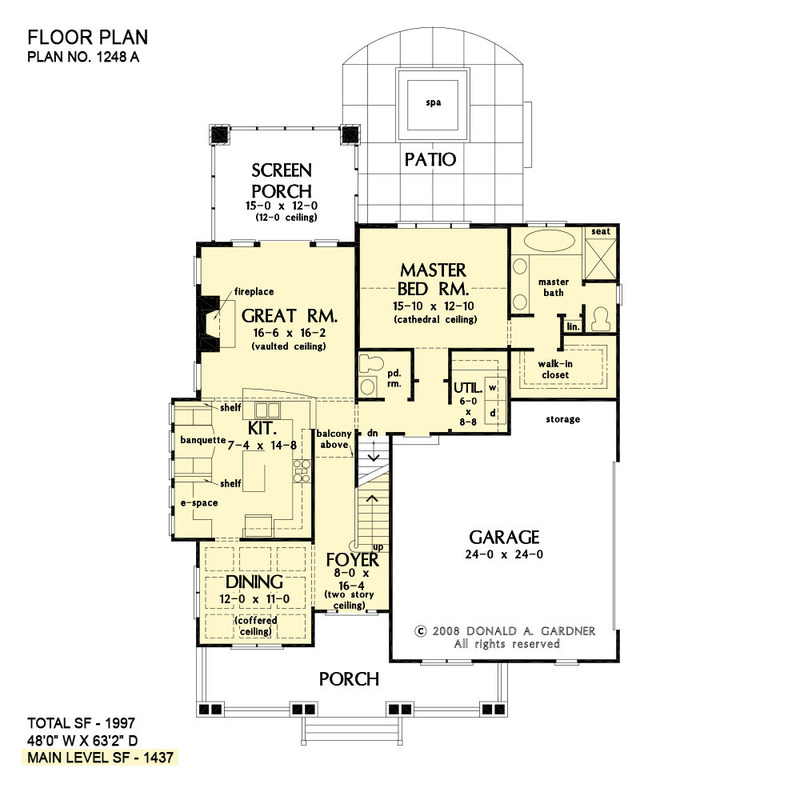 Two bedrooms, a bath with two vanities and bonus space complete the second floor. 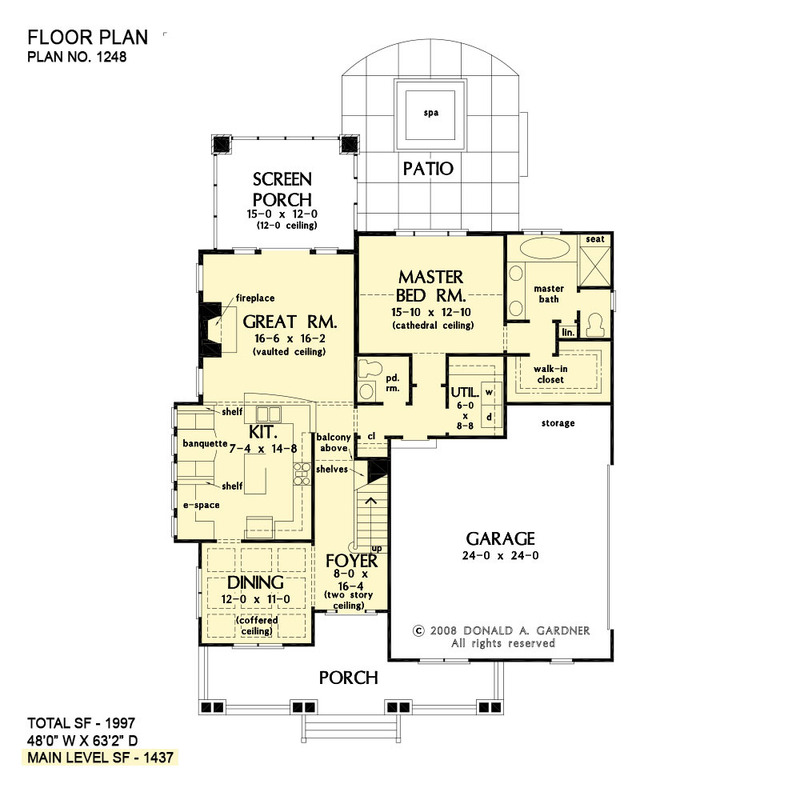 The bonus room provides adequate space for a fourth bedroom or large home office in this home plan. 1st Floor: 1437 Sq. Ft. 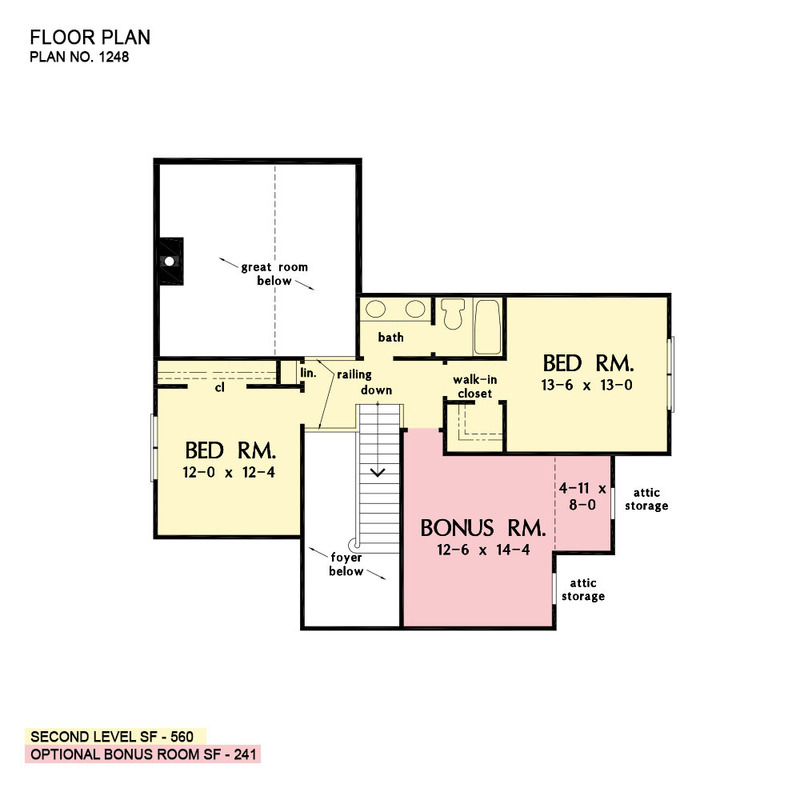 Bonus Room: 241 Sq. Ft.
House Dimensions: 48' 0" x 63' 2"
Great Room: 16' 6" x 16' 2"
Master Bedroom: 15' 10" x 12' 10"
Bedroom #2 : 13' 6" x 13' 0" x 8' 0"
Bonus Room : 12' 6" x 14' 4" x 8' 0"
Deck / Patio : 19' 4" x 21' 0" x 0' 0"
Dining Room (Coffered): 12' 0" x 11' 0" x 10' 0"
E-Space : 4' 0" x 6' 0" x 9' 0"
Foyer (Flat): 8' 0" x 16' 4" x 18' 0"
Garage Storage : 11' 4" x 3' 8" x 0' 0"
Great Room (Vaulted): 16' 6" x 16' 2" x 18' 0"
Kitchen : 7' 4" x 14' 8" x 9' 0"
Master Bedroom (Cathedral): 15' 10" x 12' 10" x 12' 5"
Other : 4' 0" x 8' 8" x 9' 0"
Porch - Front : 33' 4" x 7' 6" x 9' 0"
Porch - Screen : 15' 0" x 12' 0" x 12' 0"